There are two major problems when blending, how it’s done and what you use when you are doing it. We are going to tackle both problems and by doing it your eyes will become the sultry set we both know you can create. Start off with your primer and wait a few minutes then cover your eye lid to the crease with your white eye shadow. For true smoky eyes, use a pale gray not white. Then place your dark eye shadow starting halfway on out to the outer corner of your eyes. You can stop there. Or you can keep going out about one fourth of inch to put in the place the eye shadow needed to create that amazing V. Now that is done is further into this article. You should have the dark eye shadow up to in to the crease of your eye as well. When you look at your eye it looks like you have a half circle from the inner eye lid to the middle with the white eye shadow and followed by the other half of the circle being the dark eye shadow. The dark should start when you look straight ahead, the dark should start at where the dark of your eye are. 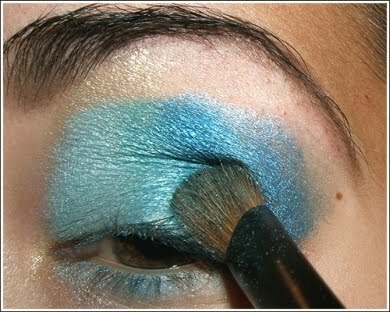 Now using small brush strokes with your blending makeup brush, you blend going from the inner lid out. But it must be all in one direction or its going to become muddy. You start blending at the line out over your lid to meet up with the outer corner of your eyes. It’s up to you just how much you want to blend. You can blend till there is no line between the dark or white or you can leave some, it’s totally up to you. What ever you do don’t go back and forth like windshield wipers because will for sure create black eyes not smoky eyes. When it comes to blending one should use a makeup brush created just for that because of the way the brush is built. It will blend the eyeshadow along the top lashes better because it can get closer to the base of the lashes. Use the angled brush to put on eye shadow as eyeliner if you don’t care to use an eyeliner pencil. Sometimes a eyeliner pencil can be harder on your lid by pulling at it where as eye shadow is go in place. Now if you want the V at the corner of your eyes, then take your eye shadow dark color out as far you want your V to be. Then blend it so that it doesn’t look hard. You can even turn the tip up as to create cat eyes smoky eyes. As you blend make sure you are brushing out not back and forth because again you will make it look muddy. Start with a little of the dark color blend the line till have it as dark as you care for it to be. This technique can be done with any two colors. Teal and purples are showing up as the in colors to use as well as shades of blue. Smoky eyes are whatever color you want it to be there is no fast rule that it must be black. Too many women have tried to create smoky eyes only to end up either looking like they slept in their makeup or black eyes. Whatever you do the best thing you can do for your lower lashes is not to line on your eye lid. It may look really cool on those models in the pictures but they are not wearing it all the time. You can get eye infections by doing so. If you are using mineral eye shadow and you get some on your cheek, take a Q-tip dipped in either moisturizer or even just water to remove it. You can even take a round sponge and pick up the eye shadow without getting it anywhere more. After you have your eye shadow just like you want it, now its time to put on your mascara. are wearing fake lashes but without the fuss and mess. Take a good look at your eyes in natural light once you are done to make sure that the look you are going for is there. Creating the perfect smoky eyes is a breeze once you have done it a few times. Don’t forget that you do not need a dark color lips because you want your eyes to be what is noticed not your lips. If you wear dark lipstick then forget the smoky eyes. Now go put on your favorite outfit, walk through your favorite perfume and off you go!